The implosion of the Soviet Union was the culmination of a gripping game played out between two men who intensely disliked each other and had different concepts for the future. Mikhail Gorbachev, a sophisticated and urbane reformer, sought to modernize and preserve the USSR; Boris Yeltsin, a coarse and a hard drinking "bulldozer," wished to destroy the union and create a capitalist Russia. The defeat of the August 1991 coup attempt, carried out by hardline communists, shook Gorbachev's authority and was a triumph for Yeltsin. But it took four months of intrigue and double-dealing before the Soviet Union collapsed and the day arrived when Yeltsin could hustle Gorbachev out of the Kremlin, and move in as ruler of Russia. 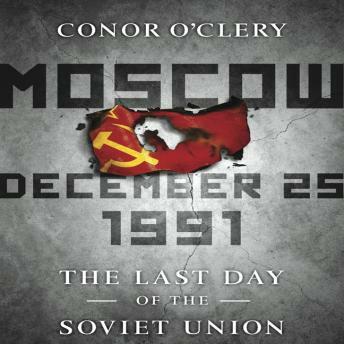 Conor O'Clery has written a unique and truly suspenseful thriller of the day the Soviet Union died. The internal power plays, the shifting alliances, the betrayals, the mysterious three colonels carrying the briefcase with the nuclear codes, and the jockeying to exploit the future are worthy of John Le Carre or Alan Furst. The Cold War's last act was a magnificent dark drama played out in the shadows of the Kremlin.